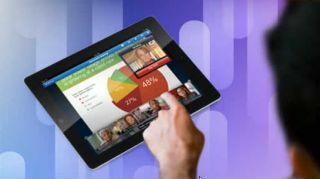 Cisco's WebEx Meetings app has just been updated for Android and iOS and it now features; two-way video for Android Tablets, and support for high-resolution content sharing, and support for the iPads high-res Retina screen. The new versions of the app allow users to get the most out of the video capabilities of their tablet and to join in on any WebEx meeting as if they were on their desktop. As well as the new video features, tablet users can do a lot more than just view the presentation on the app. You can now schedule, start, and cancel a meeting from within the apps Meeting Pane, invite others to meetings, and pass presenter capabilities to another participant. The only thing you can't do is to present content from the iPad, we'll keep you posted on when this will available. The workaround is you can however view content shared from other's computers. So if you are the meeting host, you can pass presenter control to another computer user who has a copy of your presentation and is on a desktop and share the content that way. The app is free and anyone can attend a WebEx meeting for free, but you need a WebEx host account is needed to schedule and host a meeting. There's a 14-day trial account available and webEx accounts start at £30 a month.